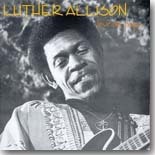 In the mid 1970s, Luther Allison was frustrated with his career path, or lack thereof. Signed to Motown�s Gordy subsidiary in 1972, he appeared on the way to bigger things, a potential crossover to the pop/rock genre. However, he quickly grew frustrated with his producers and the lack of promotion that the label gave his releases, which made little impact at the time. In 1976, Allison made his first trip to Europe, to appear at the Montreux Jazz Festival, where he was a huge success. The next year, he returned to tour France, backed by Black & Blue Records, who also recorded Allison�s Love Me Papa while he was there. Allison fell in love with the city of Paris, its people and culture. In Europe, he reached that star status that had eluded him in his home country. Allison�s own songs are impressive as well, baring his soul for the listener. The moving title track, in essence a response to the title track of Allison�s Delmark release from several years earlier, Love Me Mama, has lyrics that he made up on the spot. �It�s Too Late� is a frank song about a troubled relationship. �Luther�s Boogie� is a funky West Side-flavored instrumental. In fact, the West Side sound permeates these tracks, more so than on a lot of his other albums. This set is more blues-oriented with less of the rock influences that are often present on his tracks. Not that it�s gone completely, just less out in front than on previous and subsequent releases. Not long after Love Me Papa was released, Luther Allison settled in Paris, where he remained for many years, entertaining scores of European fans, who loved his fervent vocal style and his ferocious guitar, received him like a rock star. He eventually returned to the U.S. in the mid �90s and reached the same level of popularity with the blues audience before tragically succumbing to cancer in 1997.